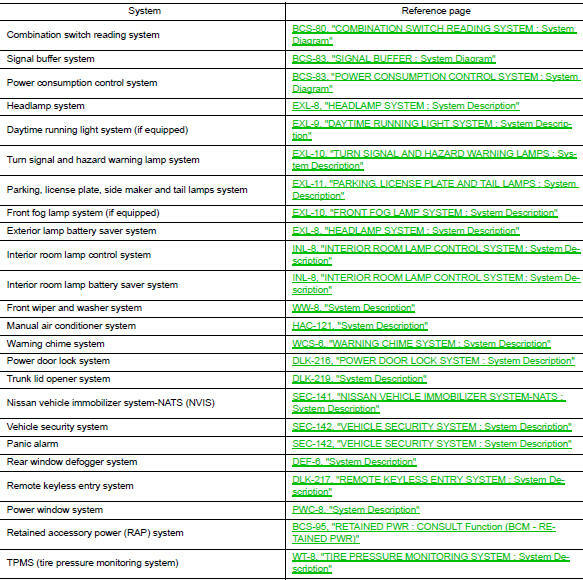 Bcm (body control module) controls various electrical components. It receives the information required from can communication and the signals received from each switch and sensor. 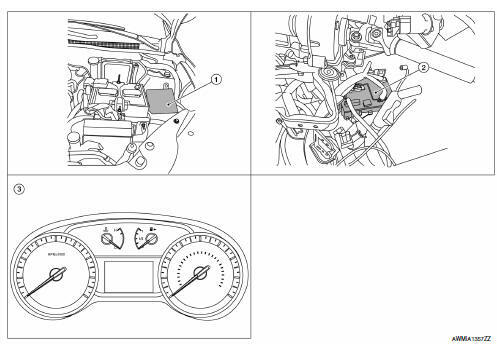 Bcm has a combination switch reading function for reading the status of combination switch (light, turn signal, wiper and washer) in addition to functions for controlling the operation of various electrical components. It also has a signal transmission function for other systems, and a power consumption control function that reduces the power consumption with the ignition switch off. BCM is equipped with a diagnosis function that operates with CONSULT and allows for various settings to be changed. BCM reads the status of the combination switch (light, turn signal, wiper and washer) and recognizes the status of each switch. BCM has a combination of 5 output terminals (OUTPUT 1 - 5) and 5 input terminals (INPUT 1 - 5). It reads a maximum of 20 switch states. BCM reads the status of the combination switch at 10 ms intervals normally. BCM reads the status of the combination switch at 60 ms intervals when BCM is controlled at low power consumption control mode. BCM operates as follows and judges the status of the combination switch. It operates the transistor on OUTPUT side in the following order: OUTPUT 1 → 2 → 3 → 4 → 5, and outputs voltage waveform. The voltage waveform of OUTPUT corresponding to the formed circuit is input into the interface on INPUT side if any (1 or more) switches are ON. It reads this change of the voltage as the status signal of the combination switch. In the following operation example, the combination of the status signals of the combination switch is replaced as follows: INPUT 1 - 5 to вЂњ1 - 5вЂќ and OUTPUT 1 - 5 to вЂњA - EвЂќ. The circuit between OUTPUT 4 and INPUT 5 is formed when the TAIL LAMP switch is turned ON. BCM detects the combination switch status signal вЂњ5DвЂќ when the signal of OUTPUT 4 is input to INPUT 5. BCM judges that the TAIL LAMP switch is ON when the signal вЂњ5DвЂќ is detected. The circuits between OUTPUT 1 and INPUT 5 and between OUTPUT 4 and INPUT 5 are formed when the TURN RH switch and TAIL LAMP switch are turned ON. BCM detects the combination switch status signal вЂњ5ADвЂќ when the signals of OUTPUT 1 and OUTPUT 4 are input to INPUT 5. BCM judges that the TURN RH switch and TAIL LAMP switch are ON when the signal вЂњ5ADвЂќ is detected. BCM has the signal transmission function that outputs/transmits each input/received signal to each unit. BCM incorporates a power saving control function that reduces the power consumption according to the vehicle status. BCM switches the status (control mode) by itself with the power saving control function. 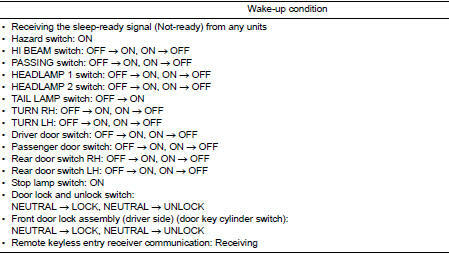 It performs the sleep request to each unit (IPDM E/R and combination meter) that operates with the ignition switch OFF. BCM reduces the power consumption with the following operation in the low power consumption mode. The reading interval of the switches changes from 10 ms interval to 60 ms interval. BCM receives the sleep-ready signal (ready) from IPDM E/R and combination meter via CAN communication. BCM transmits the sleep wake up signal (sleep) to each unit when all of the CAN sleep conditions are fulfilled. BCM is in the low power consumption mode and performs the low power consumption control when all of the BCM sleep conditions are fulfilled with CAN sleep condition. BCM transmits sleep wake up signal (wake up) to each unit when any condition listed below is established, and then goes into normal mode from low power consumption mode. Each unit starts transmissions with CAN communication by receiving sleep wake up signals. Each unit transmits wake up signals to BCM with CAN communication to convey the start of CAN communication.